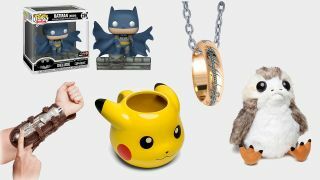 Following its suite of Cyber Monday game deals, online pop culture merchandise store ThinkGeek has gone one better and decided to make everything half price across its entire site. Yes, everything; pre-orders, Funko Pops, the whole lot. All you need to do is enter the code "DOTCOM" during checkout, and ThinkGeek will automatically reduce your price by half. Below, we've listed some of our favourite items from the sale, but you can head over to the site yourself to check out the entire range of products on store (trust me, there's a lot). This 50% off deal will only last until the end of Cyber Monday, mind, so get on it now while you still can, or have a look at the Cyber Monday Star Wars deals for something more sci-fi themed. Uncharted 4 vinyl for $14.99: 2 LP set decked out by some gorgeous cover art, now 50% off. Fallout 76 Pip-Boy for $74.99: Wear a real life Pip-Boy replica for less than $75, now 50% off. Pokemon Munchlax bag for $19.99: Whip out your bento box in style for half price off this amazing backpack. Outside of merch, we also have a range of fantastic Cyber Monday PS4 deals and Cyber Monday Xbox One deals to show you, not to mention some Cyber Monday 4K TV deals that'll easily tempt you to make the jump to a higher resolution for Red Dead Redemption 2 in time for Christmas. Check it out while you can!